Perhaps Sin Cha Hong should have called "Godot" something else. Or something more: for instance, "Thoughts of Godot," or "Meditations on Godot," or "My Godot," something that would make clear that what this South Korean dancer intends is not a direct choreographic translation of the dramatic action of Samuel Beckett's "Waiting for Godot," but a solo work giving her impressions of that play. Just as the full title of Liszt's "Dante Sonata" is Sonate d'après une lecture de Dante, so Hong provides us with a Danse d'après une lecture de Beckett. What is important for Liszt and Hong is not specific plot developments, but the personal feelings that arose in them after reading their literary sources. Hong's feelings about "Waiting for Godot" may not be everyone's. But Hong states them sincerely and makes a case for them. As in Beckett's play, there is a tree: not a scrawny one, however, but one with lots of leaves. There's also a bedlike ledge on which Hong is seen curled in a silken white gown. She appears to be languidly waking up, not in a grubby Beckettian wilderness, but in a comfortable setting that, for me, recalls the opening of Wallace Stevens's poem "Sunday Morning": "Complacencies of the peignoir, and late / Coffee and oranges in a sunny chair." The feeling of well-being is enhanced by the exquisite rustlings of an ethereal percussion score played live by its composer, David Simons. 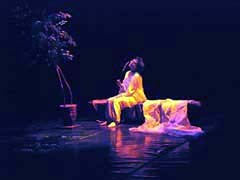 Roused, Hong wanders dreamily with a lantern, and lovingly touches herself, luxuriating in her physicality, then letting her hands and arms float above her head. After a blackout, she appears with a small suitcase filled with shoes that obviously delight her. But there's also an old pair of boots (a reference to the scruffiness of Estragon's boots in Beckett's play) with long ropelike shoelaces (another Beckettian reference). Holding the laces, she drags the boots behind her, just as in "Godot" the tyrannical Pozzo forces the luckless Lucky to follow him. Things are no longer idyllic in Hong's world, a fact emphasized both choreographically and musically when, as she totes a load of shoes, she drops them to a sudden percussion crash. Both her gestures and her facial expressions now register a sense of distress and she starts moaning and gasping. Yet, after another blackout, Hong becomes a ghostly figure shrouded in white. A taped voice recites a monologue which begins, echoing Beckett, by announcing that there is nothing to be done. There is a comparable long monologue in the play, spoken by the previously silent Lucky. But whereas that speech is an often incomprehensible philosophical and theological farrago, this voice calmly announces that humanity is blessed in waiting for Godot, while acknowledging the existence of eternal flux: "In an instant all will vanish." 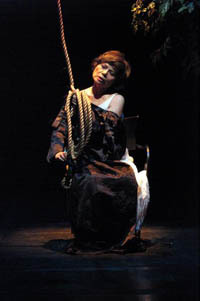 Sin Cha Hong in "Godot" at La MaMa. Unlike Beckett's scrawny tree, hers had lots of leaves. Snow falls, and a long rope dangles down from heaven which Hong puts around her, only to burst into laughter. Still laughing, she embraces the tree and caresses the air, as if rejecting the despair of suicide while serenely resigning herself to impermanence. This is Beckett without bite, whereas I am struck by Beckett's toughness. Pondering the text of "Waiting for Godot," I am made aware of grit, sweat, and bodily stink; the earthiness of garlic, turnips, radishes, and carrots, and the realities of human misery and affliction. In contrast, Hong lets the play take her into realms of spiritual questing. Well, that's her view, one that others may not share. But. with her focused presence she makes that view theatrically viable. The suitcase with the shoes in Hong's "Godot" is labeled "Fragile." So is her production.